This excellent split pulls off one of those relatively difficult feats: bringing together artists of generally disparate styles to vie for your earspace without coming across like random combination of mere pastiche. Of course, we’re not exactly talking about a Sonata Arctica/Darkthrone split – these two bands clearly spring from the gnarled roots of that aged tree called doom. Nevertheless, Cough’s nastier, caustic approach to corrosive doom doesn’t necessarily find an echo in the smoother, more traditional doom stylings of British gents The Wounded Kings. What ties this split together, then, is not texture but structure (more on which shortly). Cough’s side of the split kicks off with the welcome sound of gradually decaying guitars marking an ancient time like the tolling of leaden, tectonic bells. These first sections of the track, once they are eventually coaxed into some cantankerous riffing, lock into a molten groove with a riff that barely manages to straddle half-note steps. The fiercely raw vocals are laden with just the right amount of reverb, and though they are placed quite high in the mix, the pained howls proceed almost exclusively in short, elongated phrases, which matches the pace and intent of the riffing perfectly. About a third of the way through, some Osborne-or-Oborn (take your pick)-esque clean vocals wobble into the eldritch haze, accompanied by a marked shift to a more driving riff – this is where the Electric Wizard influence is most starkly on display. The second run-through of this chorus brings in a second guitar line, streaking through the miasma with some delightfully psychedelic soloing. This is nearly twenty minutes of harsh, confrontational punishment, but it is thoughtfully constructed and paced for maximum impact. The band seems to know how to hit all the right marks, changing things up at around the 1/3 mark as well as the halfway point, meaning that the listener is kept absolutely rapt with attention as her ears are dealt blow after doom-soaked blow. There are plenty of other bands out there tilling this same field of sludgey, psychedelic doom, but very few that I’ve come across can construct an exercise this long with such surgical care while still sounding dangerously unhinged. Perhaps the only complaint I can muster is that the cymbal hits are a bit more restrained than is my preference, especially in the ultra-slow dirge sections. Nevertheless, fans of all kinds of down-tuned noise will find as much to enjoy here as in Electric Wizard, Salome, Esoteric, or even Coffinworm. Cough’s side fades out uneasily on a bed of feedback and crushing doom chords, playing a bit like the song’s opening in reverse. Time stops, retracts – the bell is silent in its dark tower. The Wounded Kings, for their part, play a far less harsh, but no less intense style of prog-laced traditional doom. In similar fashion to Cough’s side, side B opens with a slow building instrumental section. Doomed riffs are doubled by faint organ, with some warm solo guitar bits whirling about just under the surface. Here, too, our heroes’ vocals kick in around a third of the way into the murk, but here with the clean, slightly nasal approach one would expect from these more traditional stylists. Think Reverend Bizarre, Warning, My Dying Bride, maybe even Witchfinder General on downers, and although The Wounded Kings throw in a bit more oddness than these aforementioned, the spirit is shared. These reedy vocals gain momentum, until the clearest statement of intent rings out again and again: “I’m weak, but I will endure / With blackened sorcery.” Such a simple, potent line may as well be officially adopted as this style of doom’s slogan and rallying cry. The intense and increasingly complex layering of the last section of the song (from ten minutes or so onward) invites – even dares – the listener to dive straight into the heart of the chaos, to stare directly at the sun. A swirling maelstrom of magic(k)al frequencies is drawn down around the listener, marrying the finest strains of traditional doom to these progressive flourishes of layered organ and keys with unblinking, perfectly restrained drums. Keyboards, organs, guitars, and vocals are all layered atop the other, vying for prominence in the mix, surging and struggling against one another. This type of music works tremendously well by projecting the yearning frailty of the human voice into this torrent of contrary vibration, as if demanding that the elements do their worst, against which stands, plainly, finally, a voice, some words. A somber piano outro offers a plaintive coda, solemnly adjourning the summoned forces with mute, fruitless tears. Briefest respite from the gathered darkness. As I’ve said, these bands sound, on their surface, very little like one another. The split plays, nevertheless, like an occult unity of, if not opposites, then at least tangents. Each group brings a lengthy, multi-section piece of music, and each speaks obliquely to the other by the sharing of structure, and the almost mathematical configuration of timing and movement. Thus, despite the obvious differences in their preferred brand of bleak musical output, these sonically dissimilar groups make sense together, at least with these two songs. This split, which serves as a masterful introduction to both acts (as well as the titular black arts), ends up sounding like long-separated twins, having been raised in separate countries, spontaneously putting pen to paper and channeling the same story in different languages. The tones are different, the syllables wild and unrecognized, but the message… The message resounds. Overall rating: 85%. Drugged-up or trad-ed down, the doom is coming to getchoo. An Introduction To The Black Arts will be released by Forcefield Records on November 16th. 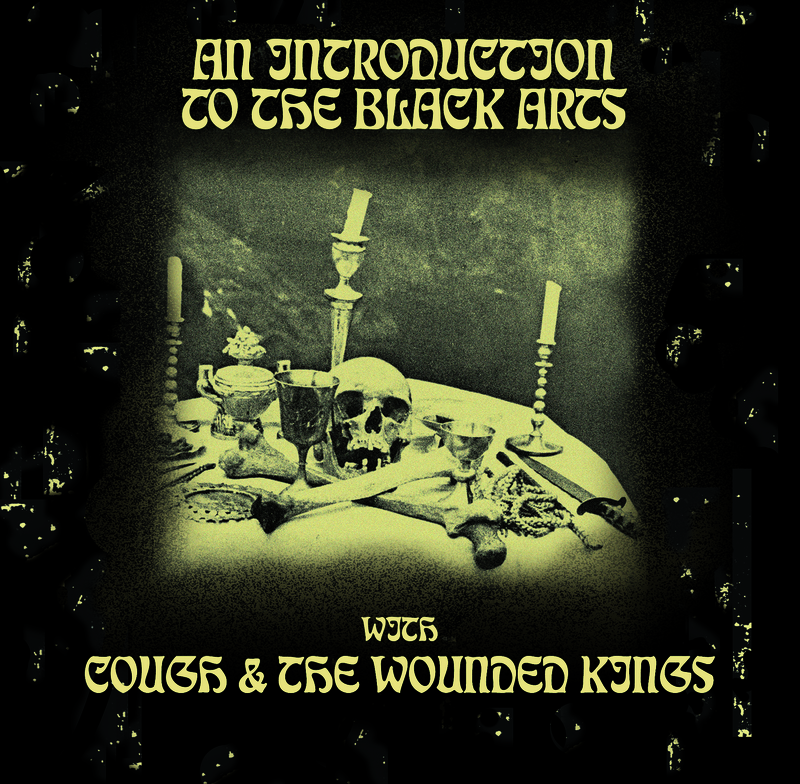 This split has also got me pretty pumped up for Cough’s upcoming full-length, Ritual Abuse, out later in October on Relapse Records, as well as wanting to revisit The Wounded Kings’ album from way back in January of this year, The Shadow Over Atlantis, which is out on I Hate Records. For you vinyl fiends out there, though, don’t miss out on your chance to doom your turntable straight to hell with this tasty split.